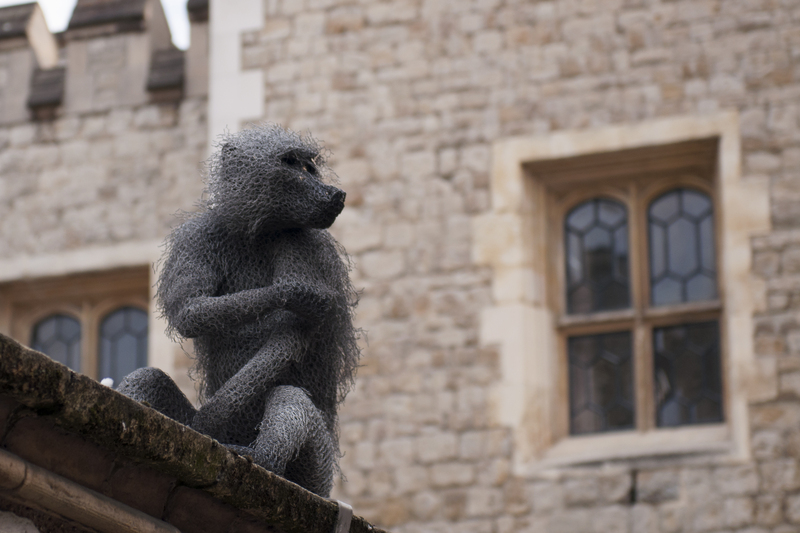 This Baboon is one of the Kendra Haste animals on exhibition at the Tower of London to remind us of the beasts that once lived in the tower. One of the lesser known roles that the Tower of London has played in its 1,000 year history is the 600 years it spent as home to the Royal Menagerie. From the reign of Henry III in the 1200’s, who received a “white bear” from the King of Norway, until 1835 when it was decided to move the animals from the Tower to the new Zoological Gardens at Regents Park (London Zoo), there were large numbers of animals in the cages of the Royal Menagerie at the Tower of London. As seems to have been the usual ,the Sheriffs of the City of London were tasked with paying to look after the Henry’s polar bear. About a year after its arrival it appears that one of them decided the costs were unnecessary and the bear was chained on a long chain that gave it sufficient room to enter the Thames and fish for his own supper – at this time the water of the Thames was clean and full of salmon. 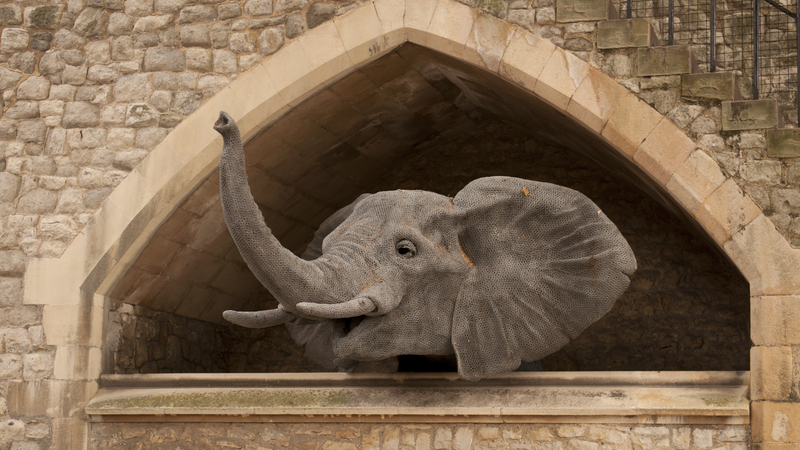 This Kendra Haste Elephant peaks through an opening in the curtain wall of the Tower of London. The largest of the animals that was housed in the Tower was an African elephant received in 1255 from the French King and was the cause of much excitement with the public coming to the Tower in droves to see the elephant. Unfortunately, as the centuries passed, the lives of the animals in the Tower were not always happy. In the reign of James I, the animals were ordered to be pitted against each other for his own entertainment. He built a platform in the grounds from which he could watch the Royal Games and see these animals tear each other apart. 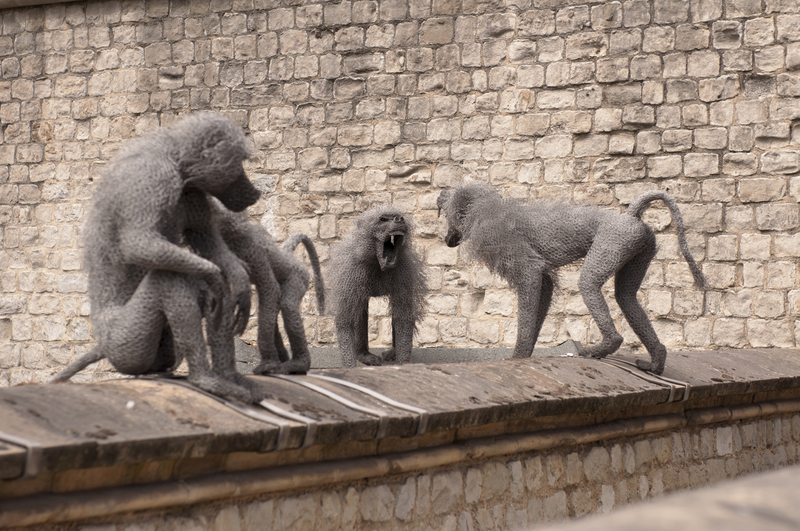 Kendra Haste injects life into the animals of the Tower of London with this fighting troop of baboons. The Tower was of course also home to various species of monkeys and in the 1780’s they were kept in a furnished room for the amusement of the public who were amazed by the human like qualities of the animals. It appears from reports at the time that this was rethought after one monkey injured a child (having his leg ripped open). This was certainly not the only incident with the animals in the Tower. In 1686, Mary Jenkinson learnt that stroking a lion was not a good idea when it mauled her arm and tore the flesh open all the way to the bone. 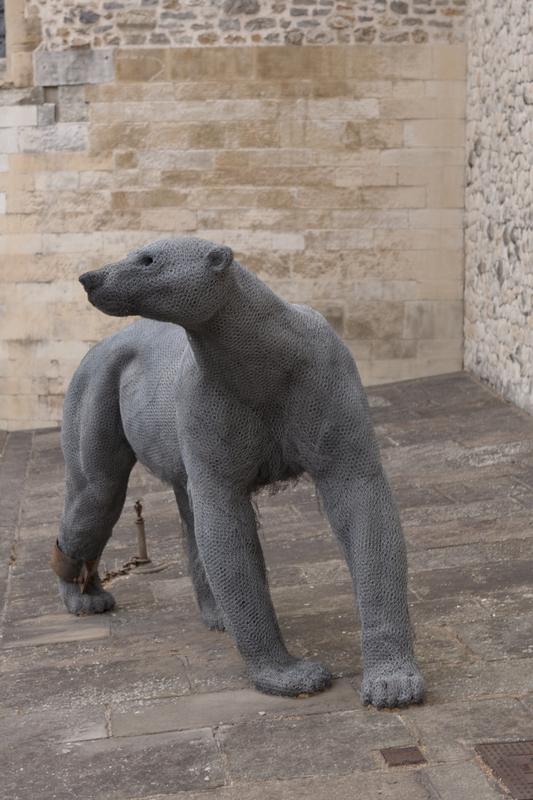 The wonderful, fun sculptures made of wire add a great deal to the story of the animals in the Tower and are certainly worth keeping an eye out for when you visit the Tower of London (see more of her amazing work at http://www.kendrahaste.co.uk ). The installation in the Tower is expected to run until 2021.